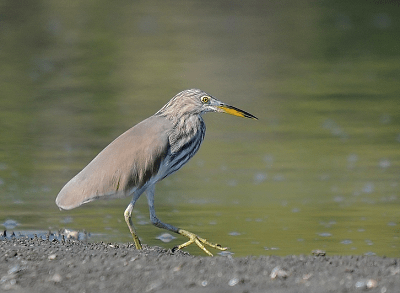 Indian pond heron (Ardeola grayii) Complete detail – updated. 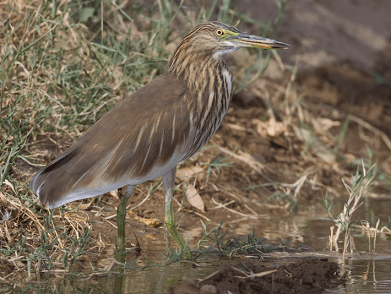 Description of Indian pond heron (Ardeola grayii) – Khunch bagula. Classification of Indian pond heron (Ardeola grayii). Habit and habitat of Indian pond heron (Ardeola grayii). 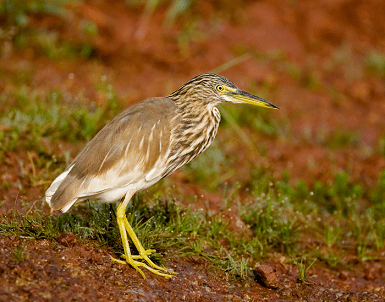 The Indian Pond Heron is a shallow aquatic habitat bird. Sometimes it may live at fresh, salt, natural or human made aquatic places. The Indian Pond Heron is a small drab brown or in breeding pink buff, heron with pure white wings and rump visible in flight. Indian Pond Heron is one of the solitary foragers. These species are semi-colonial breeders. Size of Indian pond heron is between 40 cm to 50 cm including the tail. Wingspan is between 70 cm to 90 cm. The Weight of adult is between 230 g. to 280 g. The bill is yellow horn with a long black tip. The lores are green and the irises are yellow. It has drab brown back feathers streaked with buff covering much of its upper wing. The upper wing and flight feathers are white, except the outermost flight feather is dusky with a brown-grey shaft, the two or three adjacent flight feathers have dusky tips. Its rump and tail also are pure white. It’s under parts are white with heavy buff streaking on the breast. The legs and feet are dull green. The lores and base of the bill are reported as blue or orange, with the rest of the bill remaining yellow and black………. They nests at the time between May to September. The material for building the nest should be collected by the male only. The Indian Pond herons lay 3 to 7 eggs, glossy blue or white in (olive brown) color. They are used to migration after breeding……………..
Indian species of heron. 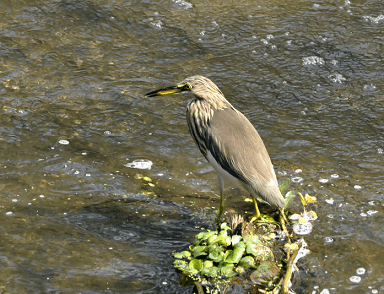 Local name of Indian pond heron is Khunch bagula. Size of Indian pond heron is between 40 cm to 50 cm including the tail. Wingspan is between 70 cm to 90 cm. The Weight of adult is between 230 g. to 280 g.
The Indian Pond Heron is a small drab brown or in breeding pink buff, heron with pure white wings and rump visible in flight. The bill is yellow horn with a long black tip. The lores are green and the irises are yellow. It has drab brown back feathers streaked with buff covering much of its upper wing. The upper wing and flight feathers are white, except the outermost flight feather is dusky with a brown-grey shaft, the two or three adjacent flight feathers have dusky tips. Its rump and tail also are pure white. It’s under parts are white with heavy buff streaking on the breast. The legs and feet are dull green. The lores and base of the bill are reported as blue or orange, with the rest of the bill remaining yellow and black. The plumage of the heron looks in different colors like blue, black, green, brown and white. The Indian pond heron is one of the birds which have long and strong legs. The legs and feet of the herons are held backward when they take flight. In the breeding season, the head and neck are unstreaked brown buff. The upper parts are pink buff. Long feathers of the upper back and wings are deep maroon. With time these feathers become duller and mottled dark brown when worn. The breast has elongated brown buff feathers. These plumed areas together form a loose coat. The remaining under parts are white, with elongated buff feathers growing from the buff-tinged breast. The legs turn bright yellow, and sometimes show a salmon-pink flush early in the season, apparently well before the nuptial plumes are fully developed. 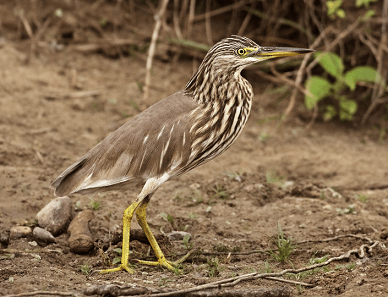 The Indian Pond Heron is a shallow aquatic habitat bird. Sometimes it may live at fresh, salt, natural or human made aquatic places. It prefers places like very shallow, non-flowing or slowly flowing aquatic regions. 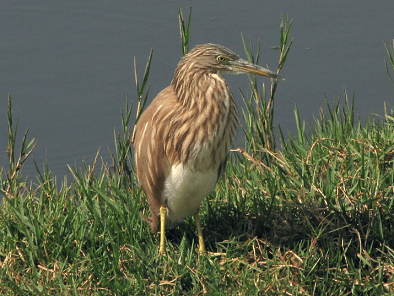 The Indian Pond Heron prefer marshy wetlands as their feeding habitat. Indian Pond Heron is one of the solitary foragers. These species are semi-colonial breeders. Mainly, they feed on crustaceans, aquatic insects, fishes, tadpoles and sometimes leeches. If the heron lives outside the wetlands, they take insects such as crickets, dragonflies, bees and amphibians as their food. The voice has not been thoroughly documented. The high-pitched Squawk Call is a flight call. The “Wakoo” call, rendered “wa, koo” is a breeding call. It is described as very human-like. Flight is fast and agile when taking off and landing in cover. They are able to retract and extend their neck during the flight time. As the summer season approaches, the feathers on the neck of adult herons start growing and become long. The wings of the Pond herons are white in color. This is the reason that when they gain flight, they look totally white. They nests at the time between May to September. It used to take the courtship in the nest only. It prefers bamboo, willows, eucalyptus and mangroves trees to build the nest. The nest should be placed above 2 to 16 m from the ground. Few pond herons may build the nest in the ground because of not having suitable trees to build their nest. They prefer the human habitation location to build the nest and they are used to living in the same colony place for many years. Male Indian pond heron will come first and start building the nest to attract the female pond herons. After getting paired, the pair continues to build the nest. The material for building the nest should be collected by the male only. The Indian Pond herons lay 3 to 7 eggs, glossy blue or white in (olive brown) color. They are used to migration after breeding season only.